Elder Golden was born on 1 June 1952 in Johannesburg, South Africa, to Christoffel and Maria Oosthuizen Golden. As a young man, he completed nine months of military service in 1971. From 1977 to 1979, he served in the Johannesburg South Africa Mission. His studies at the University of South Africa resulted in a degree in political science in 1986 and then a postgraduate honors degree in international politics in 1990. After his mission, he met his future wife, Diane Norma Hulbert, who had graduated as a registered optometrist. He finished college while she served a mission in Johannesburg. They married on 12 December 1981 and are now the parents of four children, ages 11 to 17. A successful businessman, Elder Golden has worked in banking and in pharmaceuticals. He was given the opportunity of a promotion and a move to Paris, but chose instead to remain in South Africa. Later he started an optical marketing business. 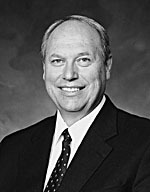 Elder Golden, who has served as a Young Men president, ward mission leader, bishop, and stake president, has served as an Area Authority Seventy for six years.